A comment about your final Paper • I am giving you a bonus day of grace to get your final Paper in to me. 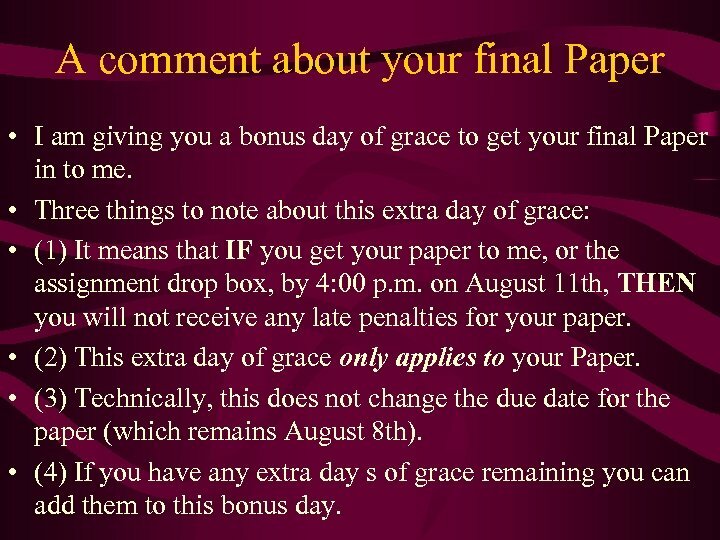 • Three things to note about this extra day of grace: • (1) It means that IF you get your paper to me, or the assignment drop box, by 4: 00 p. m. on August 11 th, THEN you will not receive any late penalties for your paper. • (2) This extra day of grace only applies to your Paper. • (3) Technically, this does not change the due date for the paper (which remains August 8 th). • (4) If you have any extra day s of grace remaining you can add them to this bonus day. Third in-class quiz and grade spreadsheet • Do remember that due to my oversight in not giving a third in-class quiz, each of you have received an automatic ‘ 2 out of 2’ for the ‘quiz that wasn’t’. 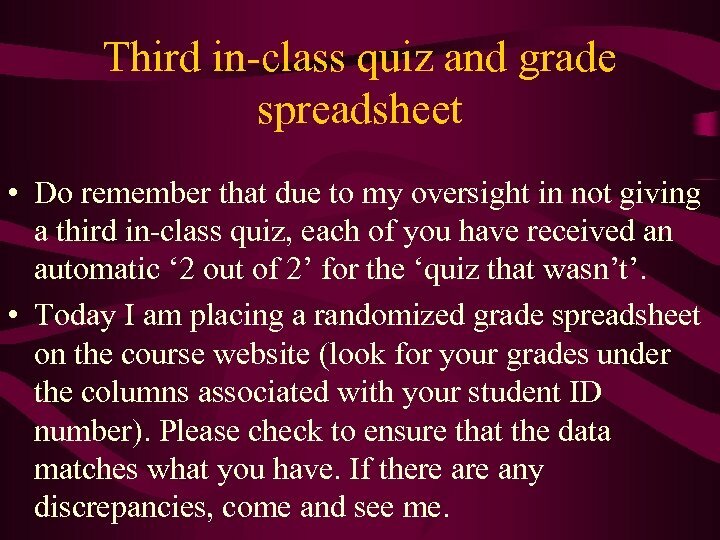 • Today I am placing a randomized grade spreadsheet on the course website (look for your grades under the columns associated with your student ID number). Please check to ensure that the data matches what you have. If there any discrepancies, come and see me. 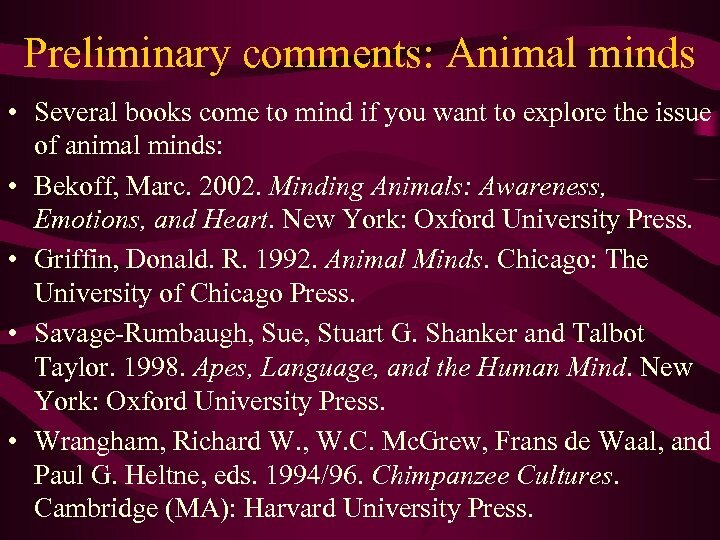 Preliminary comments: Animal minds • Several books come to mind if you want to explore the issue of animal minds: • Bekoff, Marc. 2002. Minding Animals: Awareness, Emotions, and Heart. New York: Oxford University Press. • Griffin, Donald. R. 1992. Animal Minds. Chicago: The University of Chicago Press. • Savage-Rumbaugh, Sue, Stuart G. Shanker and Talbot Taylor. 1998. Apes, Language, and the Human Mind. New York: Oxford University Press. • Wrangham, Richard W. , W. C. Mc. Grew, Frans de Waal, and Paul G. Heltne, eds. 1994/96. Chimpanzee Cultures. Cambridge (MA): Harvard University Press. 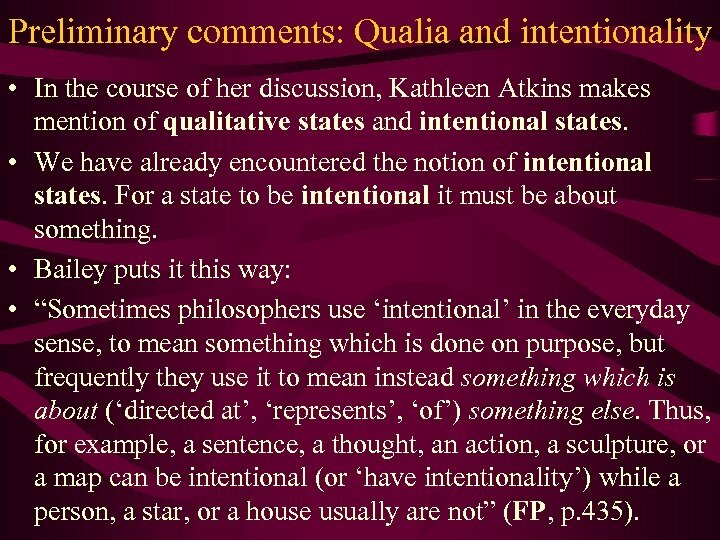 Preliminary comments: Qualia and intentionality • In the course of her discussion, Kathleen Atkins makes mention of qualitative states and intentional states. • We have already encountered the notion of intentional states. For a state to be intentional it must be about something. • Bailey puts it this way: • “Sometimes philosophers use ‘intentional’ in the everyday sense, to mean something which is done on purpose, but frequently they use it to mean instead something which is about (‘directed at’, ‘represents’, ‘of’) something else. Thus, for example, a sentence, a thought, an action, a sculpture, or a map can be intentional (or ‘have intentionality’) while a person, a star, or a house usually are not” (FP, p. 435). 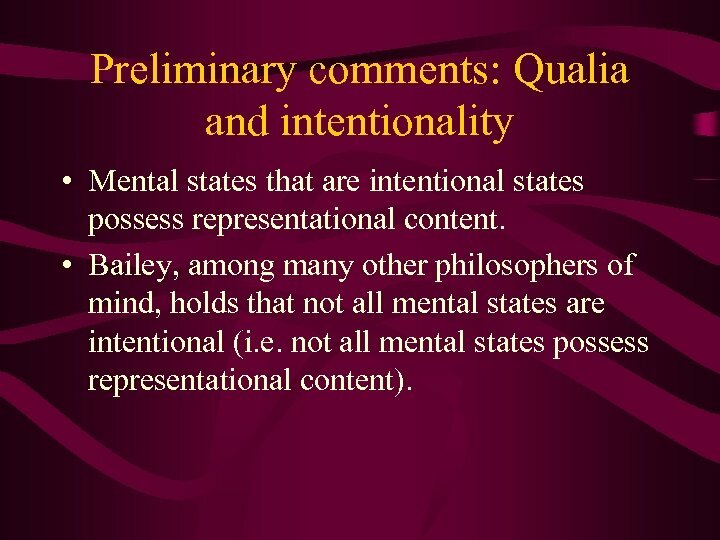 Preliminary comments: Qualia and intentionality • Mental states that are intentional states possess representational content. • Bailey, among many other philosophers of mind, holds that not all mental states are intentional (i. e. not all mental states possess representational content). Preliminary comments: Qualia and intentionality • Qualitative states are mental states that possess a certain or particular ‘feel’ to them. The particular ‘feel’ of a mental state is often referred to as a quale (singular), and the feel of various mental states as qualia (plural). • Bailey, again, puts it this way: • “[T]he sensations of being tickled and the smell of cooking onions both have a distinctive feel to them: there is ‘something it is like’ for you to be tickled” (FP, p. 390). 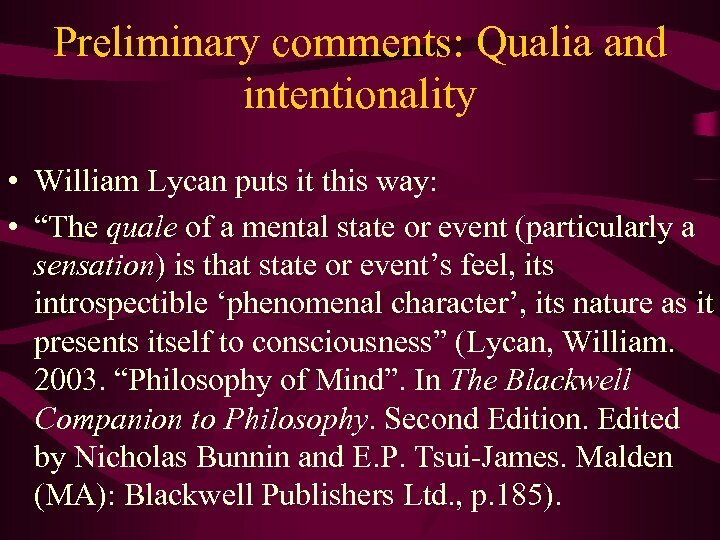 Preliminary comments: Qualia and intentionality • William Lycan puts it this way: • “The quale of a mental state or event (particularly a sensation) is that state or event’s feel, its introspectible ‘phenomenal character’, its nature as it presents itself to consciousness” (Lycan, William. 2003. “Philosophy of Mind”. In The Blackwell Companion to Philosophy. Second Edition. Edited by Nicholas Bunnin and E. P. Tsui-James. Malden (MA): Blackwell Publishers Ltd. , p. 185). 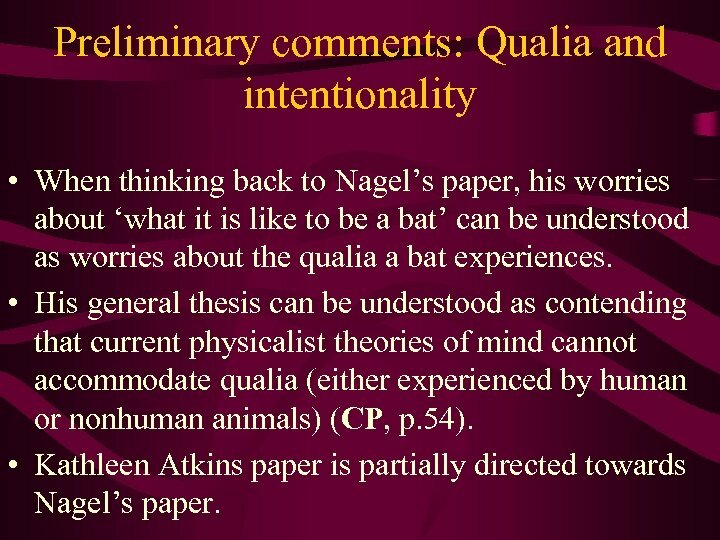 Preliminary comments: Qualia and intentionality • When thinking back to Nagel’s paper, his worries about ‘what it is like to be a bat’ can be understood as worries about the qualia a bat experiences. • His general thesis can be understood as contending that current physicalist theories of mind cannot accommodate qualia (either experienced by human or nonhuman animals) (CP, p. 54). 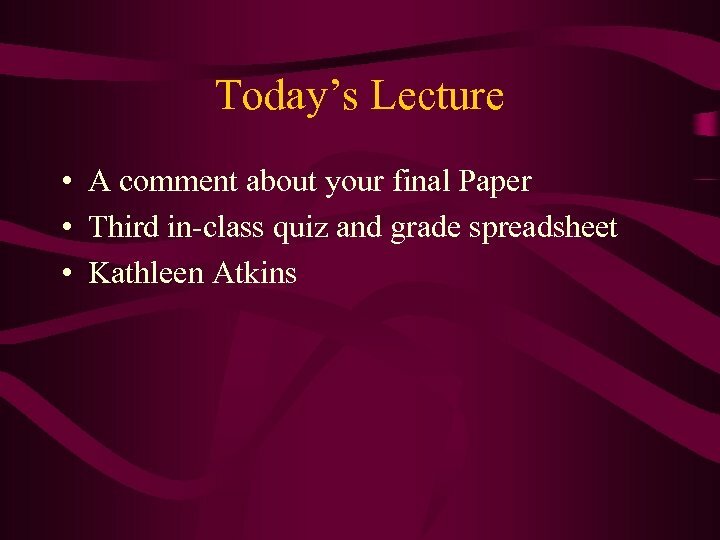 • Kathleen Atkins paper is partially directed towards Nagel’s paper. 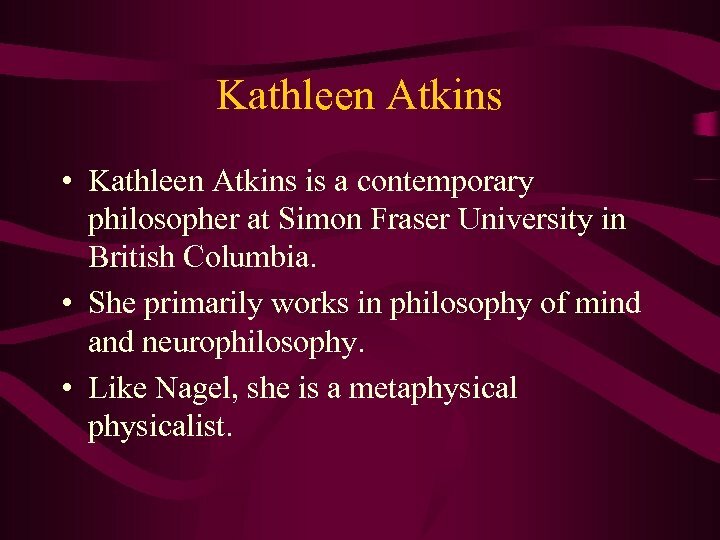 Kathleen Atkins • Kathleen Atkins is a contemporary philosopher at Simon Fraser University in British Columbia. • She primarily works in philosophy of mind and neurophilosophy. • Like Nagel, she is a metaphysicalist. 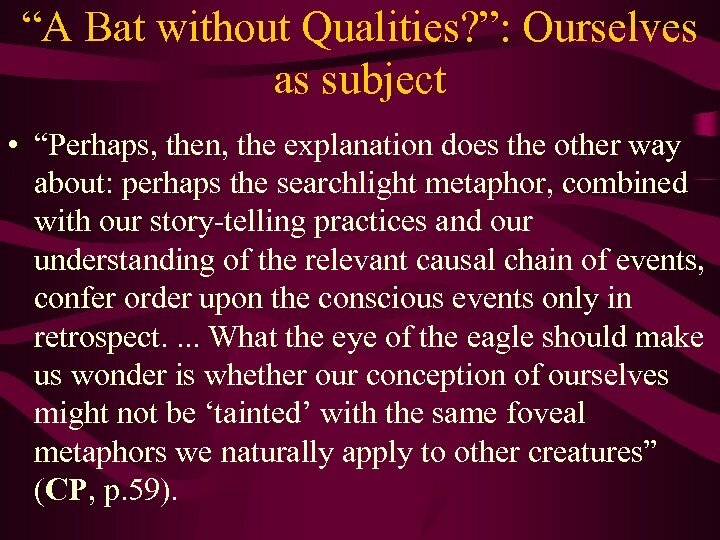 “A Bat without Qualities? 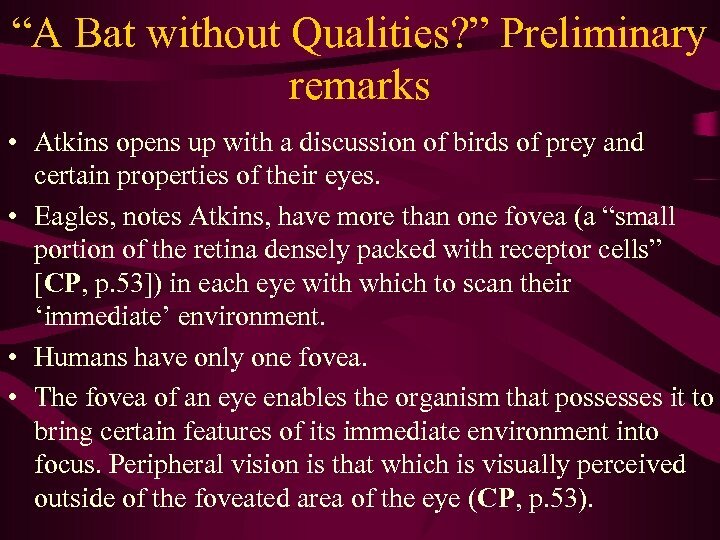 ” Preliminary remarks • Atkins opens up with a discussion of birds of prey and certain properties of their eyes. 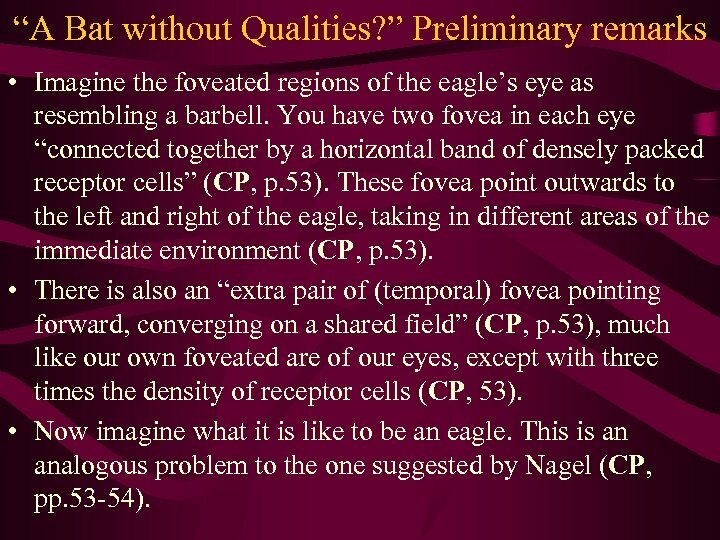 • Eagles, notes Atkins, have more than one fovea (a “small portion of the retina densely packed with receptor cells” [CP, p. 53]) in each eye with which to scan their ‘immediate’ environment. • Humans have only one fovea. • The fovea of an eye enables the organism that possesses it to bring certain features of its immediate environment into focus. Peripheral vision is that which is visually perceived outside of the foveated area of the eye (CP, p. 53). “A Bat without Qualities? ” Preliminary remarks • Imagine the foveated regions of the eagle’s eye as resembling a barbell. You have two fovea in each eye “connected together by a horizontal band of densely packed receptor cells” (CP, p. 53). These fovea point outwards to the left and right of the eagle, taking in different areas of the immediate environment (CP, p. 53). • There is also an “extra pair of (temporal) fovea pointing forward, converging on a shared field” (CP, p. 53), much like our own foveated are of our eyes, except with three times the density of receptor cells (CP, 53). • Now imagine what it is like to be an eagle. This is an analogous problem to the one suggested by Nagel (CP, pp. 53 -54). 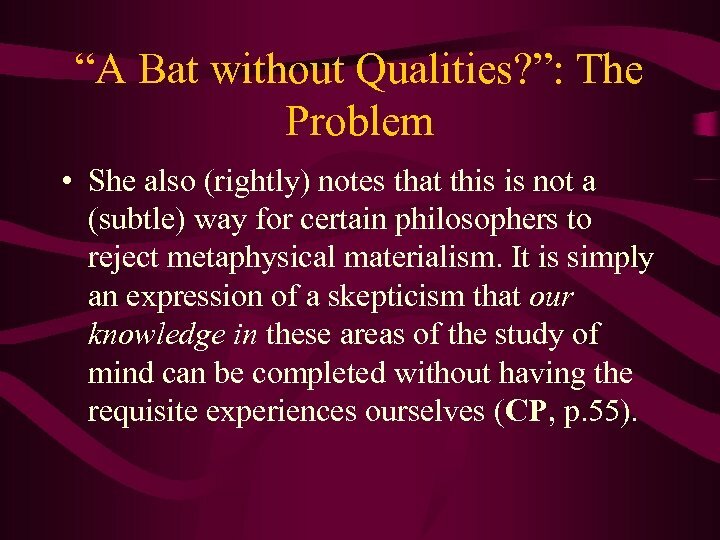 “A Bat without Qualities? ”: The Problem • I don’t think we need to go into a lot of detail here rehashing Nagel’s discussion as described by Atkins (I’ll leave that part of the reading to you). • Some things bear mentioning: • (1) Nagel’s problem is a clash between the purportedly essential subjective component of conscious experience and the need for a non-subjective point of view (i. e. an objective point of view) in the natural sciences (CP, p. 54). • (2) The only way to understand the conscious experience of another is through extrapolation from our own (i. e. the human community’s) experiences of consciousness (CP, p. 54). “A Bat without Qualities? 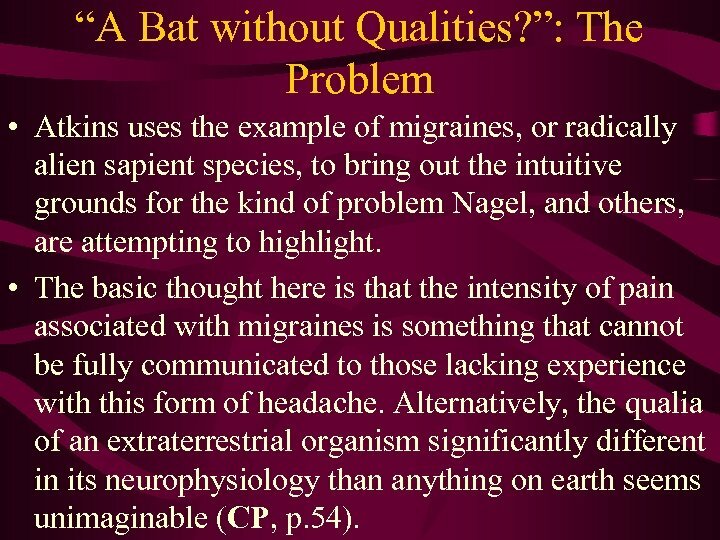 ”: The Problem • Atkins uses the example of migraines, or radically alien sapient species, to bring out the intuitive grounds for the kind of problem Nagel, and others, are attempting to highlight. • The basic thought here is that the intensity of pain associated with migraines is something that cannot be fully communicated to those lacking experience with this form of headache. Alternatively, the qualia of an extraterrestrial organism significantly different in its neurophysiology than anything on earth seems unimaginable (CP, p. 54). 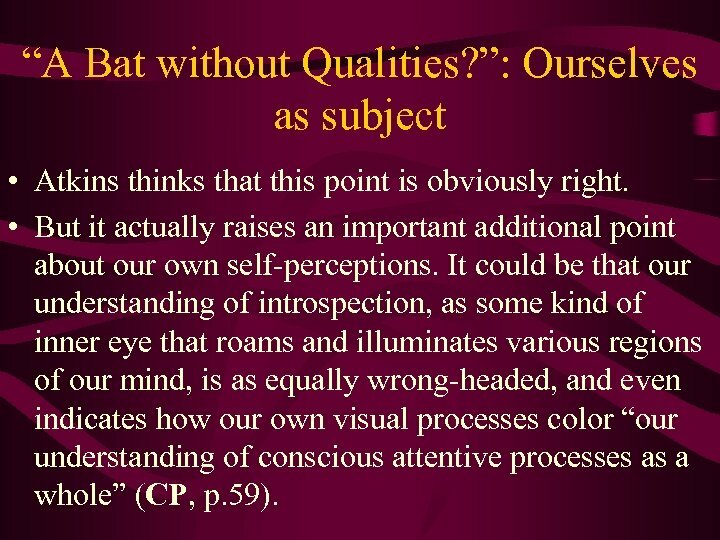 “A Bat without Qualities? ”: The Problem • Atkins now directs our focus to how this problem might be manifest in science, rather than in the imaginations of the ‘unschooled’. As she notes, this is the primary focus of Nagel’s discussion after all (CP, p. 54). 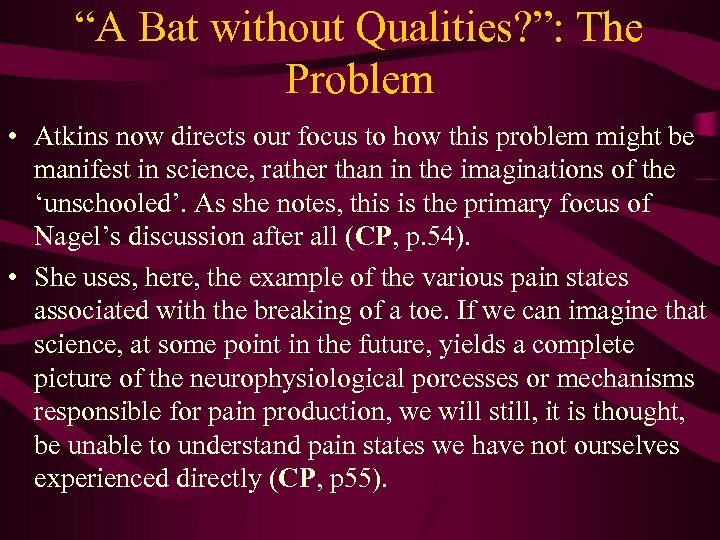 • She uses, here, the example of the various pain states associated with the breaking of a toe. If we can imagine that science, at some point in the future, yields a complete picture of the neurophysiological porcesses or mechanisms responsible for pain production, we will still, it is thought, be unable to understand pain states we have not ourselves experienced directly (CP, p 55). “A Bat without Qualities? ”: The Problem • She also (rightly) notes that this is not a (subtle) way for certain philosophers to reject metaphysical materialism. It is simply an expression of a skepticism that our knowledge in these areas of the study of mind can be completed without having the requisite experiences ourselves (CP, p. 55). “A Bat without Qualities? 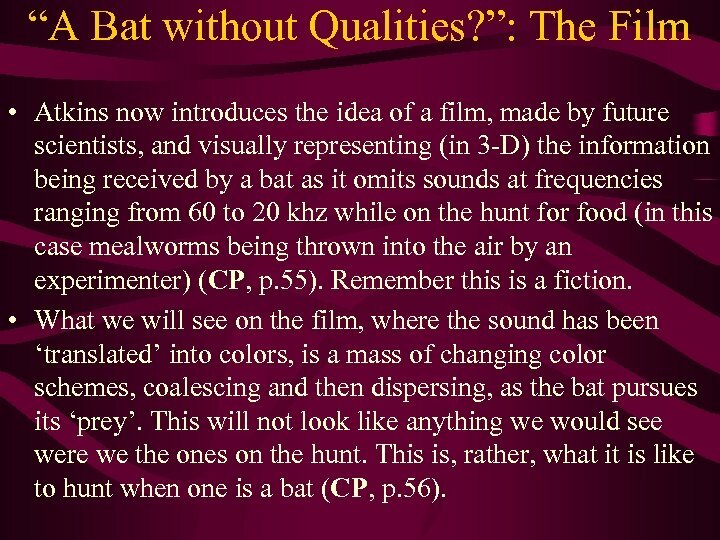 ”: The Film • Atkins now introduces the idea of a film, made by future scientists, and visually representing (in 3 -D) the information being received by a bat as it omits sounds at frequencies ranging from 60 to 20 khz while on the hunt for food (in this case mealworms being thrown into the air by an experimenter) (CP, p. 55). Remember this is a fiction. • What we will see on the film, where the sound has been ‘translated’ into colors, is a mass of changing color schemes, coalescing and then dispersing, as the bat pursues its ‘prey’. This will not look like anything we would see were we the ones on the hunt. This is, rather, what it is like to hunt when one is a bat (CP, p. 56). “A Bat without Qualities? ”: The Film • Prima facie problems with this suggestion: • (1) In watching the film we still lack the “‘sympathetic’ sensations” (CP, p. 56) associated with travelling through the air, or actually perceiving and then chasing the thrown mealworm. 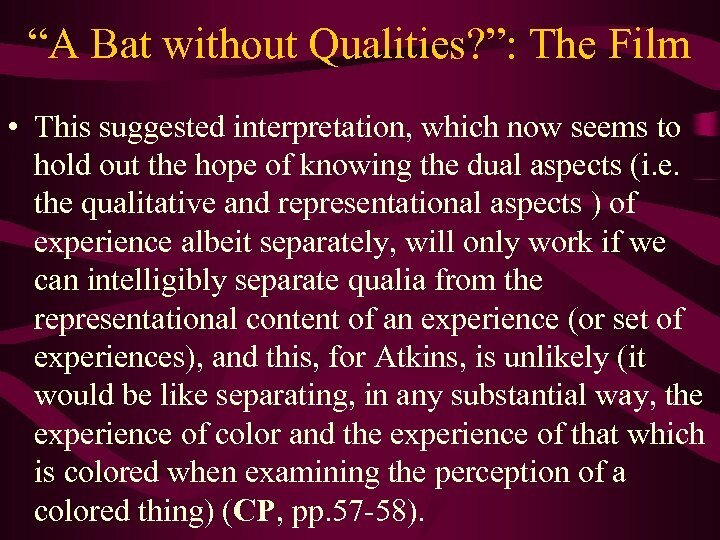 • (2) We lack the requisite knowledge of what is what as we watch the changing shapes and colors to be able to understand the events transpiring as experienced by the bat. 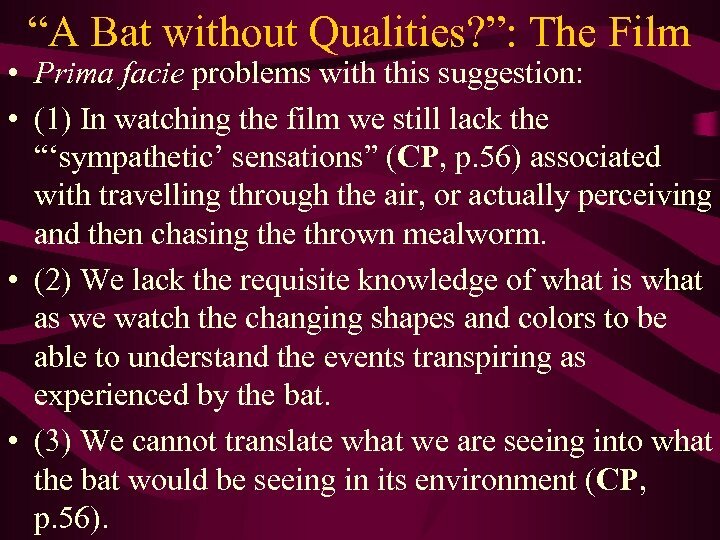 • (3) We cannot translate what we are seeing into what the bat would be seeing in its environment (CP, p. 56). 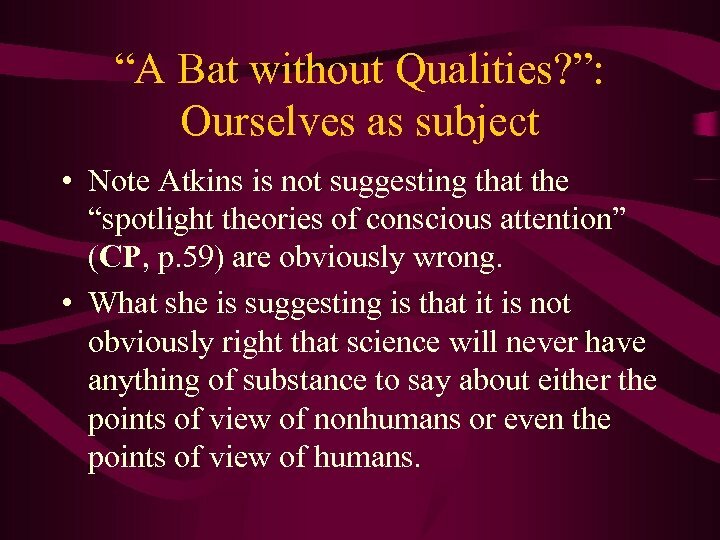 “A Bat without Qualities? 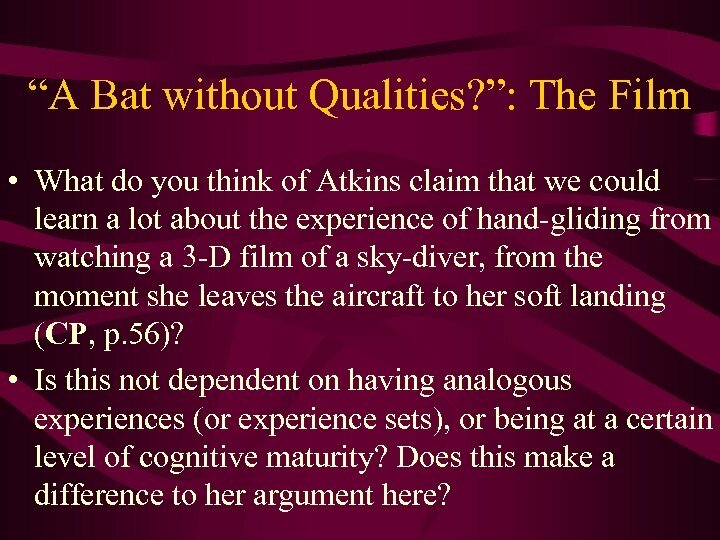 ”: The Film • What do you think of Atkins claim that we could learn a lot about the experience of hand-gliding from watching a 3 -D film of a sky-diver, from the moment she leaves the aircraft to her soft landing (CP, p. 56)? • Is this not dependent on having analogous experiences (or experience sets), or being at a certain level of cognitive maturity? Does this make a difference to her argument here? “A Bat without Qualities? ”: The Film • At first glance the problem seems to be that we use our visual system in importantly different ways than how a bat uses its auditory system. 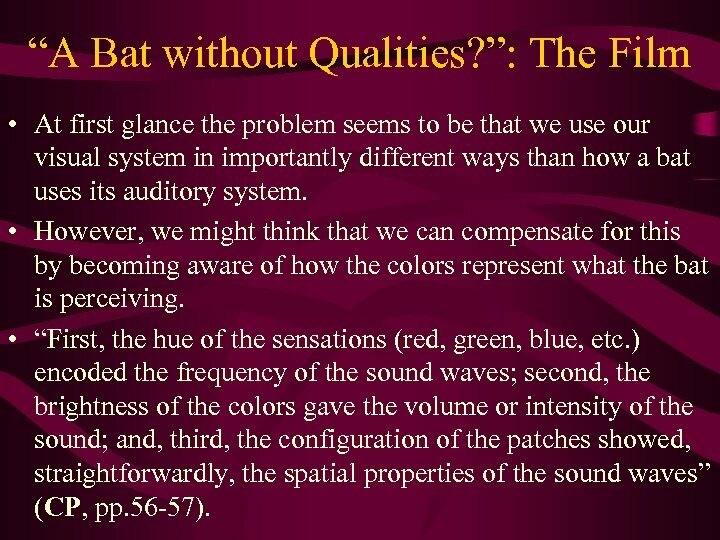 • However, we might think that we can compensate for this by becoming aware of how the colors represent what the bat is perceiving. • “First, the hue of the sensations (red, green, blue, etc. ) encoded the frequency of the sound waves; second, the brightness of the colors gave the volume or intensity of the sound; and, third, the configuration of the patches showed, straightforwardly, the spatial properties of the sound waves” (CP, pp. 56 -57). “A Bat without Qualities? ”: The Film • Now, though this will not yield an analysis, or understanding, of what it is the bat does to process auditory information when in pursuit of a tossed mealworm, it seems to promise to give us the feeling of what that pursuit is like (CP, p. 57). 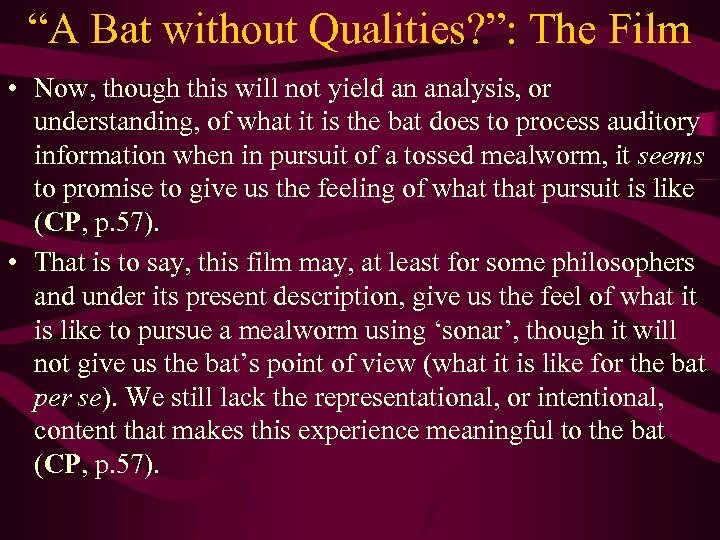 • That is to say, this film may, at least for some philosophers and under its present description, give us the feel of what it is like to pursue a mealworm using ‘sonar’, though it will not give us the bat’s point of view (what it is like for the bat per se). We still lack the representational, or intentional, content that makes this experience meaningful to the bat (CP, p. 57). “A Bat without Qualities? ”: The Film • This suggested interpretation, which now seems to hold out the hope of knowing the dual aspects (i. e. the qualitative and representational aspects ) of experience albeit separately, will only work if we can intelligibly separate qualia from the representational content of an experience (or set of experiences), and this, for Atkins, is unlikely (it would be like separating, in any substantial way, the experience of color and the experience of that which is colored when examining the perception of a colored thing) (CP, pp. 57 -58). “A Bat without Qualities? ”: The Film • “Perceiving (or imagining) moving colored patches on a screen is an intentional - or, at least, quasi-intentional - event, an experience of colored patches as colored patches. 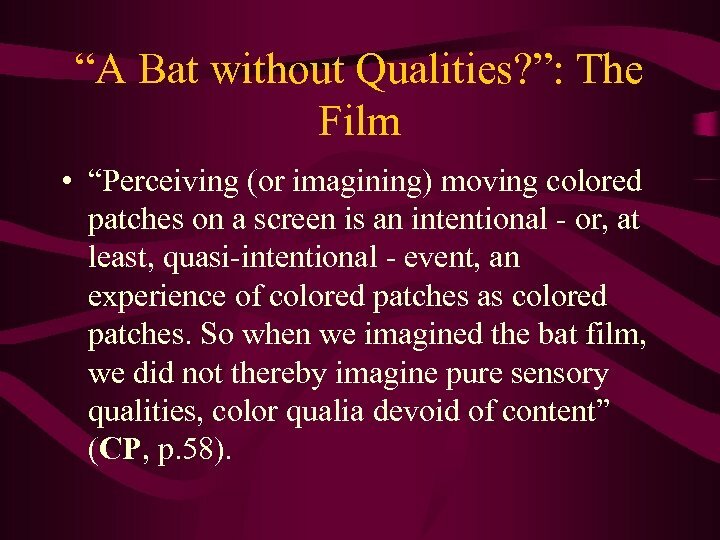 So when we imagined the bat film, we did not thereby imagine pure sensory qualities, color qualia devoid of content” (CP, p. 58). “A Bat without Qualities? 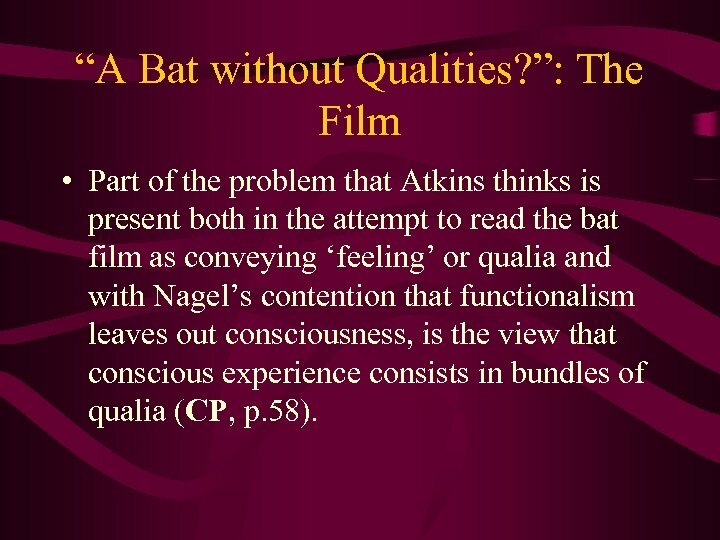 ”: The Film • Part of the problem that Atkins thinks is present both in the attempt to read the bat film as conveying ‘feeling’ or qualia and with Nagel’s contention that functionalism leaves out consciousness, is the view that conscious experience consists in bundles of qualia (CP, p. 58). “A Bat without Qualities? ”: The Film • This is misleading for the following reasons: • (1) Just because we converse with others about unique or shared experiences, does not mean that we are isolating the ‘feel’ of experiences from their intentional content in our discussions. It is unlikely that our problems, in such discussions, with communicating unique experiences has to do with the lack of a reference to the pure qualitative aspects of the states to which we are referring. 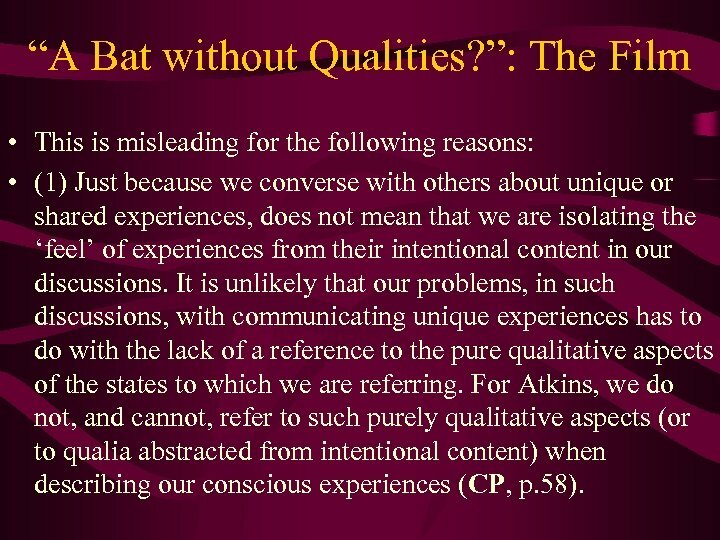 For Atkins, we do not, and cannot, refer to such purely qualitative aspects (or to qualia abstracted from intentional content) when describing our conscious experiences (CP, p. 58). “A Bat without Qualities? ”: The Film • (2) Consequently, a point of view, say one like our own, is not merely a bundle of qualia. Our conscious experiences have both qualitative and intentional aspects that cannot be meaningfully separated. 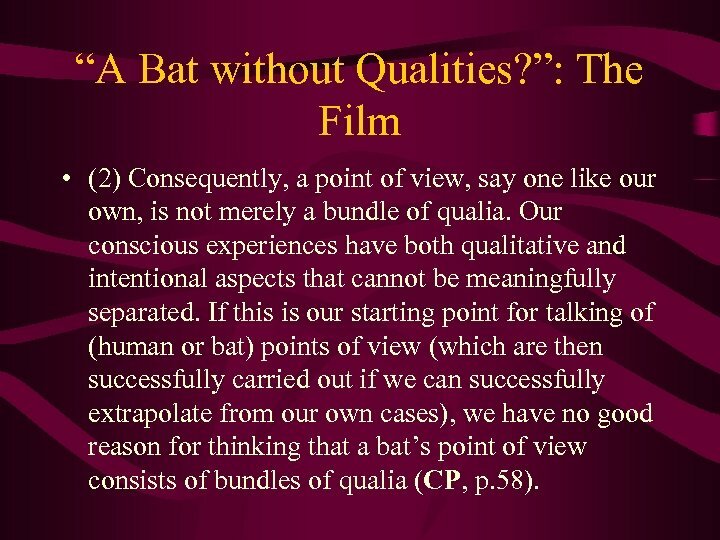 If this is our starting point for talking of (human or bat) points of view (which are then successfully carried out if we can successfully extrapolate from our own cases), we have no good reason for thinking that a bat’s point of view consists of bundles of qualia (CP, p. 58). “A Bat without Qualities? 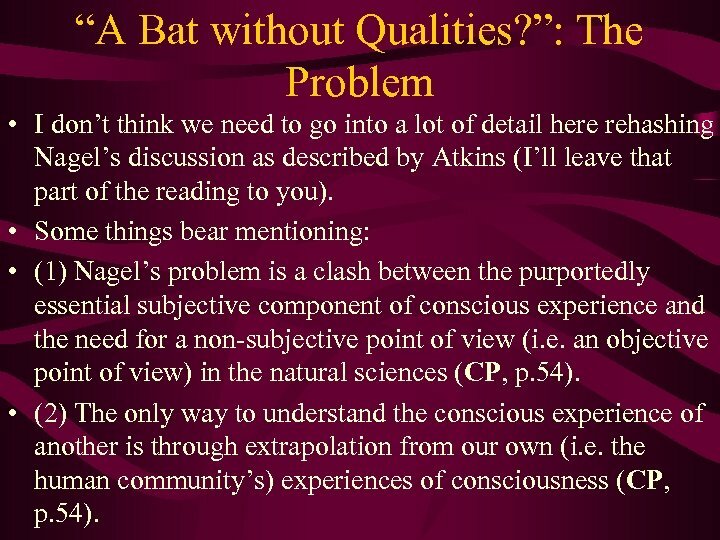 ”: The Film • According to Atkins, these two considerations allow us to reject the problem of ‘What it is like to be a Bat’ as developed by Nagel (and others like him). 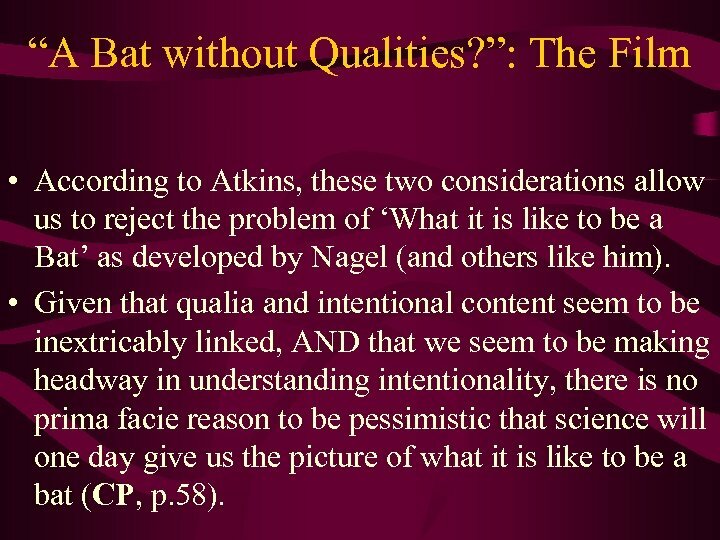 • Given that qualia and intentional content seem to be inextricably linked, AND that we seem to be making headway in understanding intentionality, there is no prima facie reason to be pessimistic that science will one day give us the picture of what it is like to be a bat (CP, p. 58). “A Bat without Qualities? ”: Ourselves as subject • This inquiry may yield interesting results in the study of our own phenomenology. (After all, it would seem that we misdescribe the problem attaching to communicating unique experiences to a fellow human). • Consider the eagle example that began the paper. 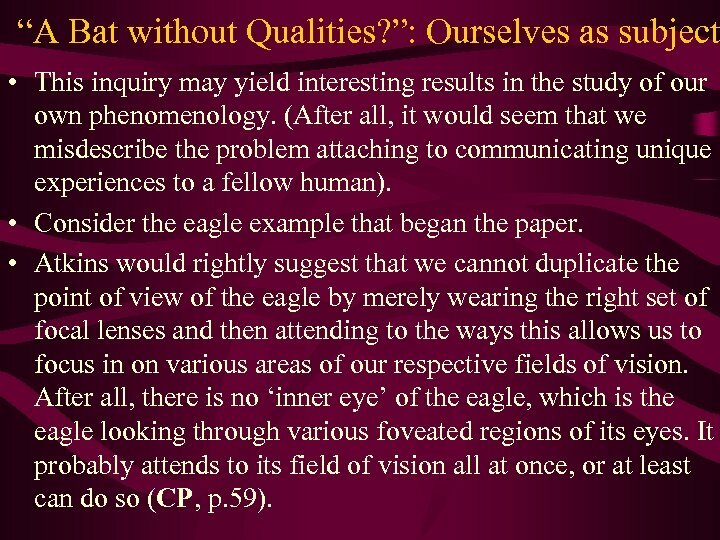 • Atkins would rightly suggest that we cannot duplicate the point of view of the eagle by merely wearing the right set of focal lenses and then attending to the ways this allows us to focus in on various areas of our respective fields of vision. After all, there is no ‘inner eye’ of the eagle, which is the eagle looking through various foveated regions of its eyes. It probably attends to its field of vision all at once, or at least can do so (CP, p. 59). “A Bat without Qualities? 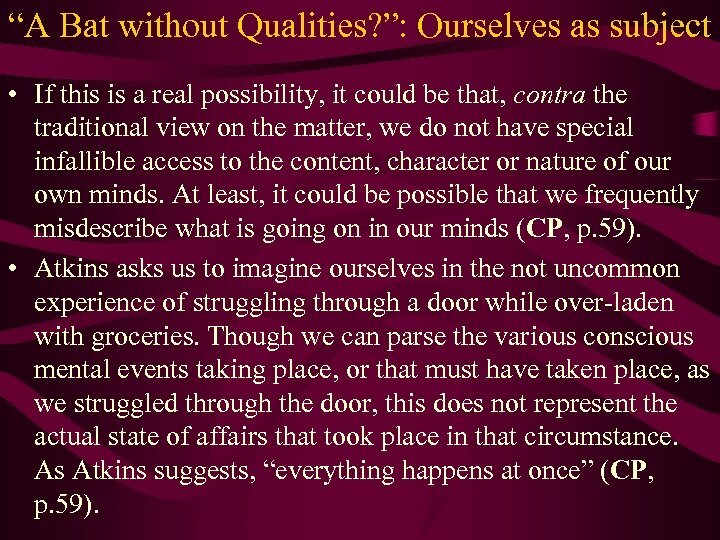 ”: Ourselves as subject • Atkins thinks that this point is obviously right. • But it actually raises an important additional point about our own self-perceptions. It could be that our understanding of introspection, as some kind of inner eye that roams and illuminates various regions of our mind, is as equally wrong-headed, and even indicates how our own visual processes color “our understanding of conscious attentive processes as a whole” (CP, p. 59). “A Bat without Qualities? ”: Ourselves as subject • If this is a real possibility, it could be that, contra the traditional view on the matter, we do not have special infallible access to the content, character or nature of our own minds. At least, it could be possible that we frequently misdescribe what is going on in our minds (CP, p. 59). • Atkins asks us to imagine ourselves in the not uncommon experience of struggling through a door while over-laden with groceries. Though we can parse the various conscious mental events taking place, or that must have taken place, as we struggled through the door, this does not represent the actual state of affairs that took place in that circumstance. As Atkins suggests, “everything happens at once” (CP, p. 59). “A Bat without Qualities? ”: Ourselves as subject • “Perhaps, then, the explanation does the other way about: perhaps the searchlight metaphor, combined with our story-telling practices and our understanding of the relevant causal chain of events, confer order upon the conscious events only in retrospect. . What the eye of the eagle should make us wonder is whether our conception of ourselves might not be ‘tainted’ with the same foveal metaphors we naturally apply to other creatures” (CP, p. 59). “A Bat without Qualities? ”: Ourselves as subject • Note Atkins is not suggesting that the “spotlight theories of conscious attention” (CP, p. 59) are obviously wrong. • What she is suggesting is that it is not obviously right that science will never have anything of substance to say about either the points of view of nonhumans or even the points of view of humans.